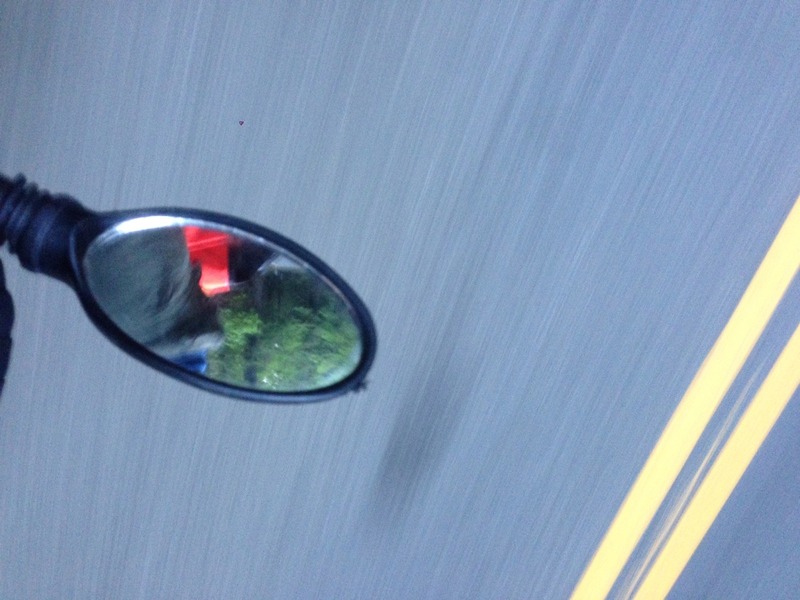 I resisted using rear view mirrors for years, largely because I was using the wrong kind for me. Many people have great luck with the versions that clip to your glasses or helmet… I always found them distracting and difficult to use effectively. For this trip, I used a version that clips and velcros to the left handlebar. What a difference! Instead of craning my neck back to look for approaching traffic that was too far away to hear, I always knew when it was safe to take the lane on curving downhills or when glass or other obstructions made travel in the shoulder a bad idea. Find the right mirror for you and start using it! If you’re lucky enough to be touring a route that has showers or other bathing opportunities (even swimming!) I can’t recommend a pack towel enough. They’re light, super absorbent and dry with a simple wringing twist. Forget your cotton towel… It’s not nearly efficient enough. Another tip: consider hitting your local dollar store… Car shammies work just as well and they’re a lot cheaper than the specialty towels at camping stores and online! Whether as a sweat rag, makeshift hair covering, pant leg tie down, or sleep mask… Bandanas have so many uses I always bring as many as I can. While they are cotton (normally a no-no) they are so thin and light that they dry quickly in the sun or on the back of the bike as you roll. While I do use synthetics for base layers, you really have to have one wool layer if you’re biking in cool or cold areas. The rumors are true: wool keeps you warm even when damp. It also resists some of the smells that those synthetics tend to trap between washes. I recommend finding a nice used sweater at your local thrift shop… I probably wore mine every day on this last tour. I have a lot to say about charging solutions on the road, but if you use any kind of USB chargeable device, I can’t recommend a high capacity battery enough. I have a 12000 mAh battery (“milliamp hours” is a measure of capacity… the higher the number, the more juice it holds!) made by NewTrent… It can recharge my iPhone from dead to full about three times before needing to be pugged in again. Battery technology is constantly improving, but the demands from our devices are also increasing. Get the biggest battery capacity you can, balanced by your budget and the size of the device. I like batteries that can charge more than one device at once.